Arabdemocracy: Prisons in Syria: Jihad Academy? The following is an extract from an investigative report published by Fadi Toufiq, a Lebanese journalist and writer, in the Lebanese daily An-Nahar on the 22nd and 23rd of August 2007. In his report, based on interviews with ex-detainees in Syrian prisons, Toufiq suggests a possible collaboration or at least tolerance of Islamic fundamentalist networks by Syrian secret services. One aspect of this "silent collaboration" involves, according to the report, moving fundamentalist Sheikhs into cells where they are allowed to preach freely to dozens of prisoners. This practice usually punished by the syrian prison authorities appears to be tolerated lately according to Toufiq's investigation. 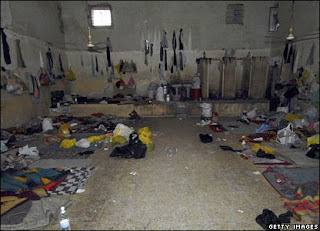 Many young prisoners will then be recruited and upon release join a number of Jihadi organisations in Iraq and Lebanon. Below is the story as told by one of these young men to the Lebanese journalist. "All of us, the residents of the cell, agreed that this man had to be a spy who was trying to set a trap to test our intentions, so we decided not to react to his statements. Those who have been in jail in Syria know that such tricks are used by the Syrian Intelligence services – planting spies among prisoners in order to entrap them. We continued to have doubts over the identity of the man until we got some information from friends who were trustworthy. We found out, my friends and I, that this man was a religious cleric, Sheikh Jalil, who was known for his loyalty, piety and devoutness. “The new information about our religious man removed our doubts, but it didn’t stop us from being cautious concerning his statements. We agreed to remain silent, and not to comment either positively or negatively. Even if our Sheikh genuinely didn’t want to entrap us, that wouldn’t prevent the consequences we could face for listening. The actions of a prisoner in a cell with 40 other people won’t affect him alone – all of us were at risk, and particularly when the mistake was this serious.Therefore, we finally decided to warn the Sheikh about the danger risked by what he is calling for, and the negative consequences it could have on him and the rest of us as residents of the same cell; in spite of this, he surprised us with his persistence in calling [for jihad] and his recklessness regarding the consequences. I can’t deny that his attitude impressed us all, the Islamists of the cell. We secretly expressed our respect for his courage, which seemed like something from a fairy tale next to our weakness and crippling fear of violating the jail’s smallest prohibitions – how then could one be so audacious as to talk openly about jihad duty, which was the jail’s the greatest prohibition? The Sheikh replied to all our warnings about the potential consequences by saying: “One who fears God doesn’t fear his servants.” He also said that God’s response to his call lay in protecting him from them (meaning the intelligence services), by rendering them oblivious to what he was doing. “Our admiration for the Sheikh hadn’t stopped us from seeing his actions as imprudent and useless. Some of us even suspected he was insane or had mental problems after so many years of imprisonment and severe torture, like many other prisoners who leave jail only after developing a mental or physical disability, or sometimes both. “All our attempts to stop the Sheikh from continuing his preaching were in vain. Since we were prisoners with no hope of release any time soon, the Sheikh’s call [to jihad] seemed pointless, with no purpose other than to cause us extra harassment from the jailers, who seek any chance to discipline, humiliate and torture us. “What really grabbed our attention then is that none of our fears had come to pass. They never called the Sheikh out for interrogation because of what he preached, and none of the room’s residents was punished, although this had used to happen regularly. As a result, some of the inmates began to embrace the Sheikh’s words, especially since most of the cell’s residents were Islamists who warmly welcomed talk about jihad. A few days later, I witnessed something that seemed to prove our Sheikh’s prophecy that God would make the Intelligence services oblivious to his actions. Once, a jailer happened pass by while the Sheikh was talking, and he didn’t take any disciplinary action against him. I still remember how much this shocked me, and I kept doubting that it had really happened until it was repeated several more times, at which point I was sure that the jailers were ignoring the Sheikh’s sermons. “That day, I wasn’t concerned about why things had changed. All that alarmed me was the violation of the jail’s most dangerous prohibition, which was significant to a prisoner whose life was dictated by many prohibitions. I remember that each time I’d start to wonder about the reason [that the jailers ignored the Sheikh’s violations], the Sheikh’s words about God protecting him would echo in my mind. At that time, it was easier for me to believe his words than to think about the reasons and motives behind this shift." If this story is true one wonders why the syrian regime refuses to learn the lessons of the US experience in Afghanistan. The Jihadist you help create always comes back to haunt you.